Tax preparation software often contains worksheets to help you figure capital gains and losses. 1. Can You Mark Stock Purchased at Various Times on a Schedule D? Internal Revenue Service Form 8949 contains capital gain and loss spreadsheets on which you can enter wash sale gain or loss information. You use this form to calculate and report your capital gains and losses for the tax year. 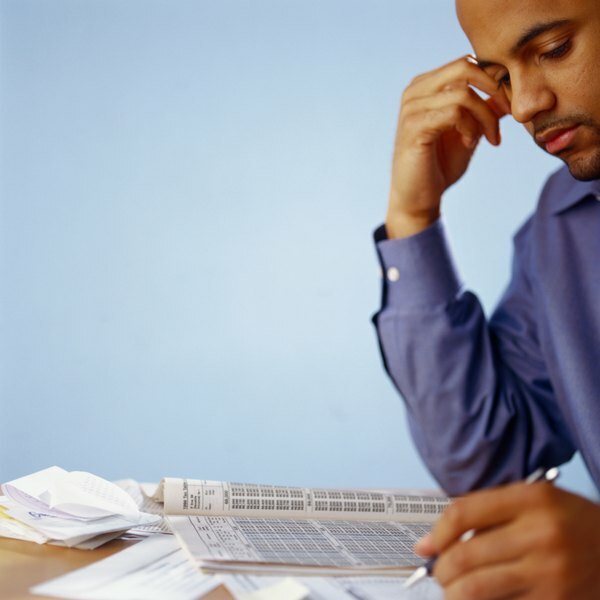 Many tax-preparation programs offer similar worksheets to guide you through each step. You can also set up your own worksheet and then transfer the information to Form 8949. You incur a capital gain or loss when you dispose of a capital asset, such as a stock, bond, commodity, personal property or real estate. The cost basis is the amount you spent to obtain an asset, including commissions. If the disposal price is higher than the cost basis, you made a capital gain. You have a capital loss if the cost basis is greater than the disposal proceeds. You create a wash sale by disposing of a security at a loss within 30 days, before or after, of buying the "substantially identical" replacement security. This includes purchases of derivative instruments such as options, warrants, and convertible securities that you can convert into the sold security. That tax provision is called the wash sale rule. Some capital gains tax strategies recommend offsetting gains with losses by planning sales in the same tax year, but wash sales don't help. You also create a wash sale if you purchase the substantially identical replacement security in an individual retirement account within 30 days of selling it in a regular brokerage account. Normally, you use capital losses to reduce capital gains, but you cannot deduct wash sale losses. “Disposal” is a more general term than “sale” because it includes short sales, in which you first sell the asset and later dispose of, or “cover,” the short sale by purchasing the short asset. When calculating capital gains and losses, purchases can precede or follow sales. Generally, your broker sends copies of Form 1099-B to you and the IRS in January, detailing the proceeds from your previous-year transactions. The broker marks the form to indicate the amount of any disallowed loss resulting from a wash sale. You use this information to complete Form 8949 or the equivalent worksheet. You are responsible for reporting all your wash sales, even if the 1099-B is incorrect or missing. Form 1099-B also indicates whether a transaction is short-term or long-term. You must hold a security for more than one year for it to qualify as a long-term transaction. You enter a row of information onto either the short-term or the long-term spreadsheet on Form 8949 for each round-trip transaction – that’s a couplet of a purchase and a sale. Each row identifies the security, the cost basis, sale proceeds and trading dates. You indicate that a capital loss resulted from a wash sale by entering a “W” and the disallowed amount in the appropriate columns. Enter the disallowed amount as a positive number and add it to the loss amount to figure the net loss. Normally, the two numbers will offset, yielding a net amount near zero – commissions might create a small negative amount. Summarize your results on Schedule D and Form 1040 or one of its variants. Remember to add the disallowed loss to the cost basis of the replacement securities when you report their eventual sale. Tax forms can change from year to year, so always review the most current instructions for each form. Wash sales aren't completely ignored from tax purposes. Although you can't directly offset capital gains with wash sale losses, you do increase the cost basis of the replacement security, thereby reducing the taxable profit or increasing the capital loss when you later sell it. You pay your normal income marginal tax rate on short-term capital gains. Long term capital gains receive preferential tax treatment, and the highest capital gains rate anyone pays is 20 percent. For 2017 and 2018, the IRS published three tax rates for long-term capital gains, so depending on your income you pay either 0 percent, 15 percent or 20 percent on such gains. Long-term capital losses offset capital gains and up to $3,000 of ordinary income, including short term gains, though netting short and long term capital gains and losses isn't allowed beyond that. You can carry over capital losses of more than $3,000 to future tax years. Starting in tax year 2019, taxpayers pay 15 percent long-term capital gains tax at modified adjusted gross income levels of: between $39,376 and $434,550 (single filers and married filing separately), between $78,751 and $488,850 (married filing jointly) and $52,751 and $461,700 (heads of household). Taxpayers pay 20 percent long-term capital gains tax at modified adjusted gross income levels of over $434,550 (single filers), more than $244,425 (married filing separately), more than $488,850 (married filing jointly) and more than $461,700 (heads of household). Income below these income levels means the gain is tax-free. Forbes: Wash Sale Trap: What Is 'Substantially Identical'? Can I Claim a Loss on the Sale of an Investment Property? What Is a Basis in a Share of Stock?